The ruins of Palais El Badia are mingled with the modern. The remains of the old palace jut out. Rugged and bare in contrast to the terracotta plaster that coats the modern city buildings. Above the constant hum of scooters and daily life there is a clicking. It is there, faint but distinct. The source is high above the city. The walls of the old palace are home to the storks. Building their scruffy nests and performing their ornate mating dances these birds are synonymous with the city. Believed by the Berber people to be transformed humans others see a prayer like position when they are resting. Whatever the source of their status within the city they are seen as sacred creatures and disturbing their nests is seen as a criminal offence. 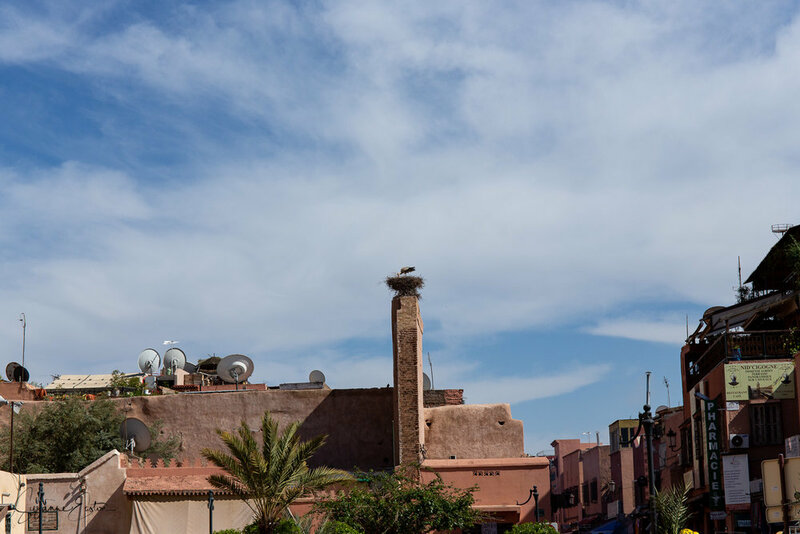 To see these huge birds just walk around the walls of Palais El Badia or Palais Bahia and look up. They will be there living their lives oblivious to the city below.